You must think I turned a few too many calendar pages at once. Last month I was doing Christmas cards and this looks a lot like a Valentine. It is a Valentine set but I think it could be a thank you or love card. Don't worry, one step outside and I know it is still a very humid summer. 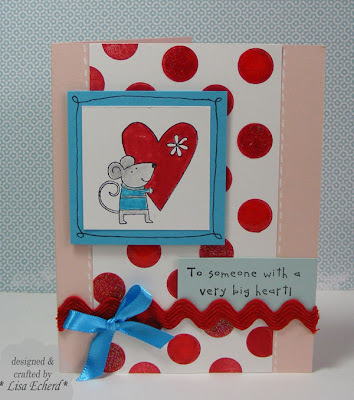 I chose this stamp to go with my polka dot background and the color scheme of Red, White and Aqua for another of Shimelle's challenges. For the background, I stamped the polka dots with regular classic Real Red ink and then went over a few of them with Versamark and some Iridescent Ice embossing powder. I used Ranger's Glossy Accents on a few more dots to give the background a little punch. I told my friends at card class this week that I've got to go to the fabric store and stock up on some ric rack. I'm out of just about every color. This was the last of the red. 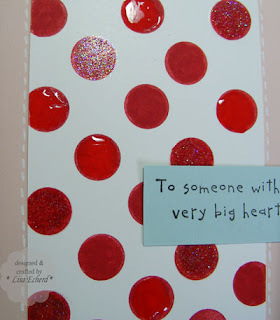 Ingredients: Stamps: Polka Dot basics by PTI; Happy Heart Day by SU! Cardstock: Tempting Turquoise, Soft Sky, Blush by Stampin' Up! Great color combo; I love the polka dots and the ric-rac!